Raphaelle Peale (sometimes spelled Raphael Peale) (February 17, 1774 – March 25, 1825) was an American painter of still-life, perhaps best-known today for his painting Venus Rising from the Sea — A Deception. Peale's tightly grouped still lifes are often permeated with a delicate melancholy akin to that which characterized the life of the artist; he was an alcoholic who suffered the effects of arsenic and mercury poisoning caused by his work as a taxidermist in his father's museum. 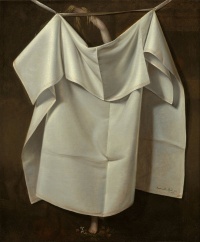 His spare, essential style may have been influenced by the Spanish still lifes he studied in Mexico and by the works of Juan Sánchez Cotán, exhibited at the Pennsylvania Academy in 1818. Peale was born in Annapolis, Maryland, the fifth child, though eldest surviving, of the painter Charles Willson Peale and his first wife Rachel Brewer. He grew up in Philadelphia, and spent his life there in a home at the corner of 3rd and Lombard. Like his siblings (all of whom were named after famous artists or scientists), Raphaelle was trained by his father as an artist. Early in his career, the pair collaborated on portraits. On some commissions, Raphaelle painted miniatures while his brother, Rembrandt, painted full size portraits. In 1792, he made a trip to South America in order to collect specimens for the Peale's Museum. His first professional exhibition was in 1795 at the age of 21. In 1797, with his brother Rembrandt, he traveled to Charleston, South Carolina, where they attempted to establish another museum. The plan fell through, however, and Raphaelle returned to painting miniatures. He married Martha (Patty) McGlathery at the age of twenty, and with her had eight children. For about two years beginning in 1803, Peale toured Virginia with the ‘physiognotrace,' a profile making machine, with which he was briefly successful. In August 1808, he was hospitalized with delirium tremens, exacerbated by severe gout. By 1813, he was unable to walk without crutches. After the downturn in his health, in an era when most artists considered still life a subject worthy only of amateurs, he devoted himself almost exclusively to still life painting. It is for these works he is best known. Raphaelle Peale is today considered the founder of the American Still Life school. His work was on frequent exhibit at the Pennsylvania Academy of the Fine Arts between 1814 and 1818. After reportedly indulging in a night of heavy drinking, his health destroyed, he died on March 3, 1825 at age 51 at his home in Philadelphia. Unless indicated otherwise, the text in this article is either based on Wikipedia article "Raphaelle Peale" or another language Wikipedia page thereof used under the terms of the GNU Free Documentation License; or on original research by Jahsonic and friends. See Art and Popular Culture's copyright notice. This page was last modified 22:17, 2 December 2013.